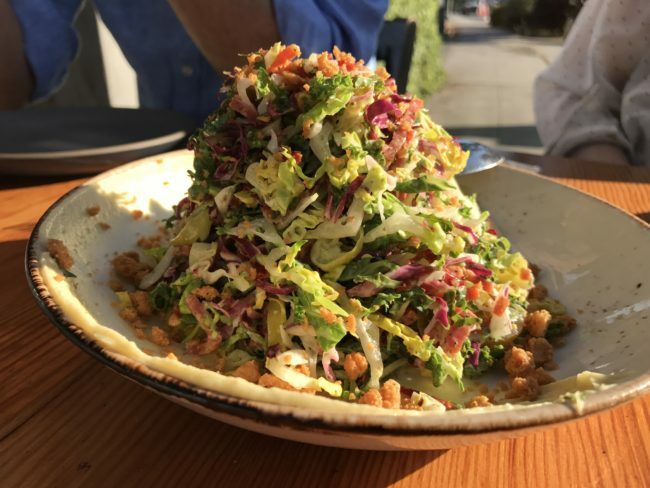 Alimento in Silver Lake had been on our dining radar ever since it opened in 2014. Unfortunately, it took us over three years to make it here (we’re very good at procrastinating) and, boy, are we sorry we didn’t try it sooner! We hooked up with friends Paul and Susan, who live in the neighborhood, for an early Sunday evening dinner and were fortunate enough to score a table on the outdoor patio. I say “fortunate” because when I poked my head inside it was pretty loud. At the suggestion of our server, our table shared four of the small plates to start, three of which garnered the coveted MaiTaiTom “Wow” rating from our table. 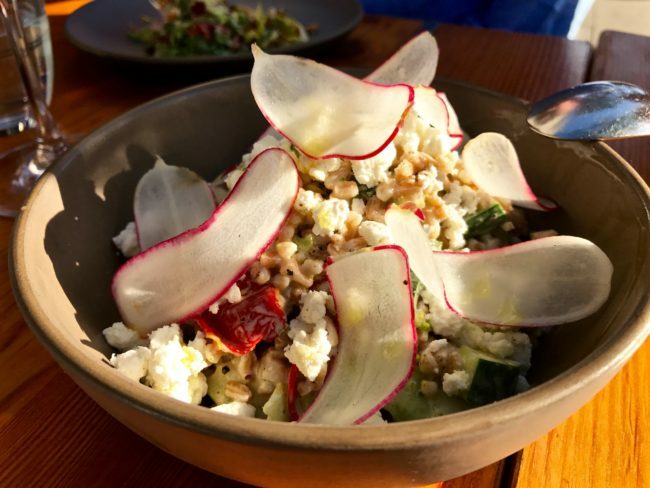 We shared the Cracked Farro Salad; raw vegetables, dried tomatoes, pecorino and shaved radishes on top ($12), and yes, it was all it was cracked up to be. We also devoured the spectacularly tasty Chopped Salad Amigliorata; pepperoncini, chickpeas, anchovy, salami ($15)…. 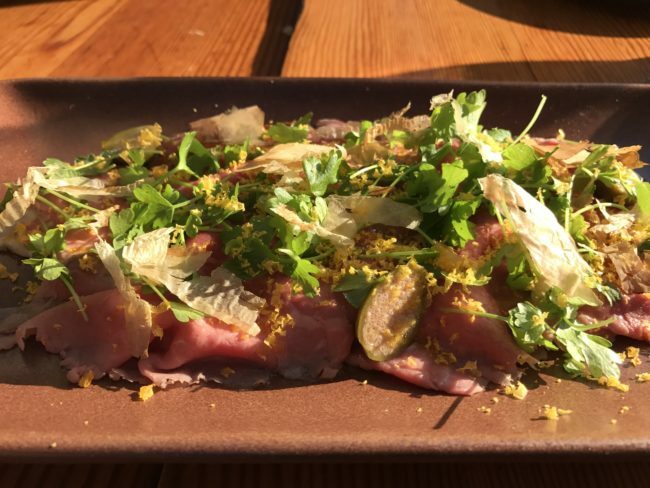 …and Beef Tonnato; carpaccio of wagyu eye of round, caper berries and bonito ($18). What a way to start! Of those four, which were all delicious, the Cracked Farro Salad and Chopped Salad Amigliorata really stood out. The flavors popped in your mouth! Susan ordered the Chicken Milanese Sandwich, which was fried chicken on a brioche bun with pepperoncini slaw and prosciutto cotto ($14). 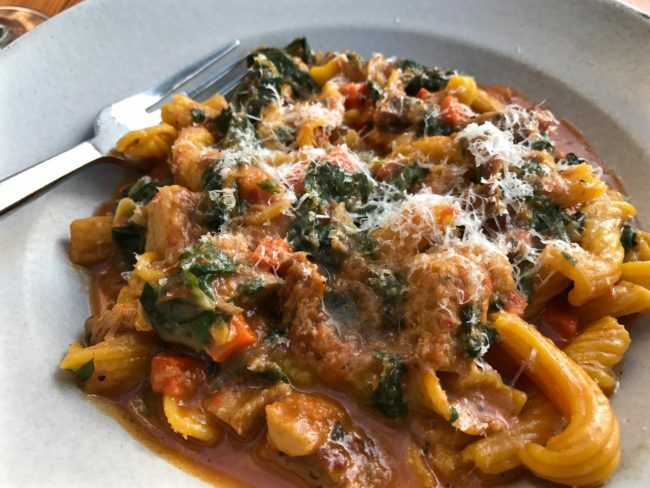 Tracy tried the Saffron Torchietti; pasta with veal osso buco rago and chard ($21). Paul and I each opted for the signature Tortellini in Brodo “Al Contrario;” contrary because this is a reverse dish with the broth inside the tortellini, rather than the tortellini floating in a broth ($15). 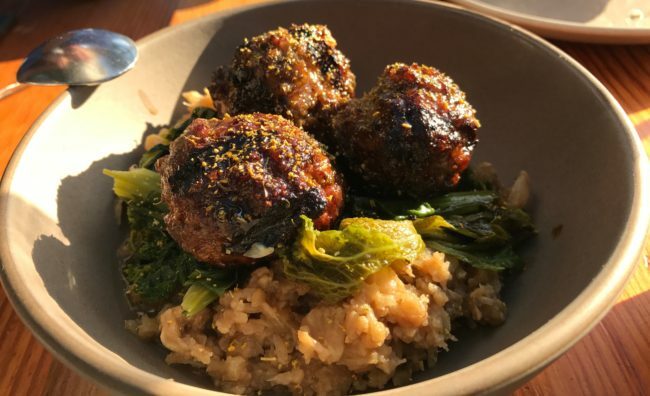 I see why Alimento considers it their signature dish. It also earned a “Wow” from our group and was so scrumptious, Paul and I ordered an additional serving to share (how does he stay so skinny?). Why stop now? For dessert the four of us shared all three desserts on the menu that evening, which were chocolate budino with caramel ($8 and addictive), almond cake with blueberries ($7) and a panacotta ($8). I can’t even tell you which one I Iiked the best…they were all great. 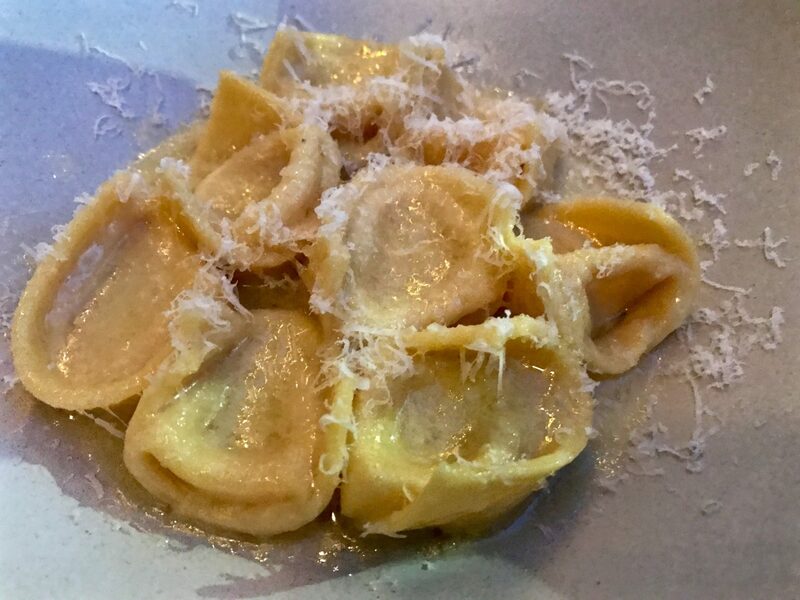 We enjoyed our dinner at Alimento so much that we returned the following week with an even larger party (Jeff, Cecilia, Ellen, Steven and Gail joined us) in order to confirm that Alimento is an early contender for MaiTaiTom’s Restaurant of the Year (it is). Expanding waistlines notwithstanding, we are always looking out for our subscribers! Returning on a Friday evening, we once again secured a table on the patio (if noise bothers you, I highly recommend reserving the patio). Just like our previous experience, our server was outstanding and friendly (don’t look at those idiotic Yelp reviews). She suggested a total of 10 or 11 dishes for our group (heck, I can eat that on my own). 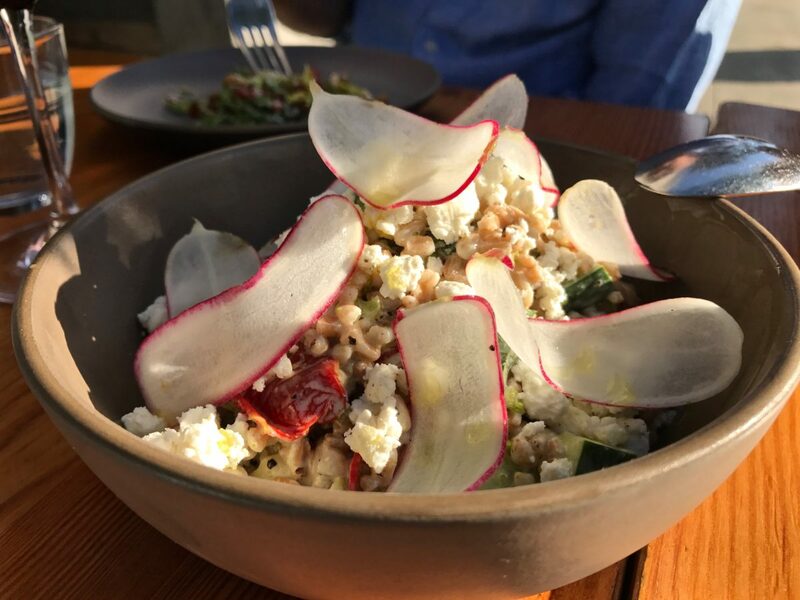 We again started with the Cracked Farro Salad and Chopped Salad, which were both equally as delicious as on our prior visit. 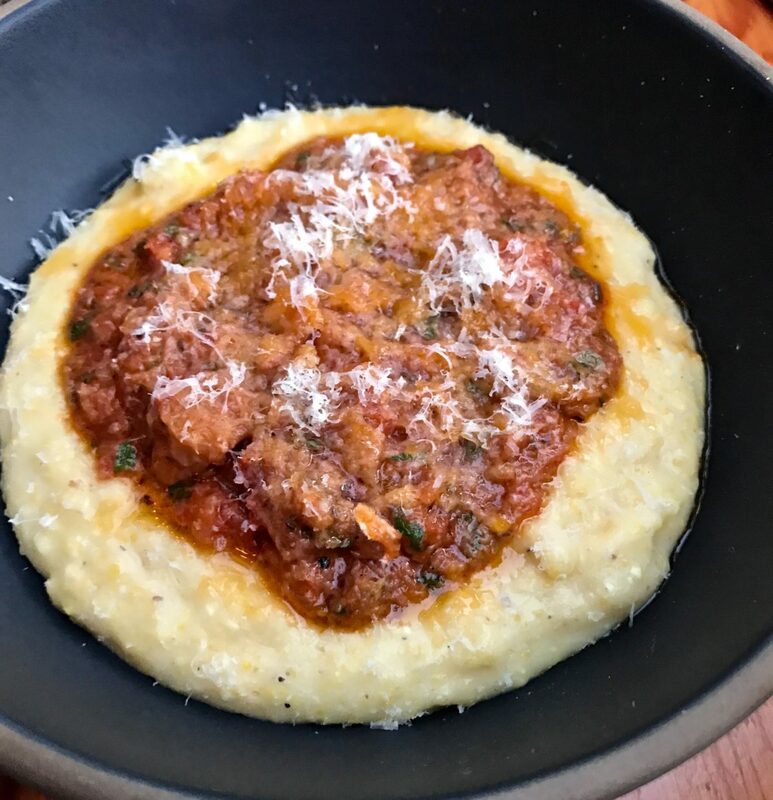 …and the Baccalá “in the style of the Mantovan Jew;” salt cod and cheeses mashed together and served over polenta ($14). I know that sounds weird, but like so many “weird” sounding dishes these days, it really worked well as the flavors melded together nicely. 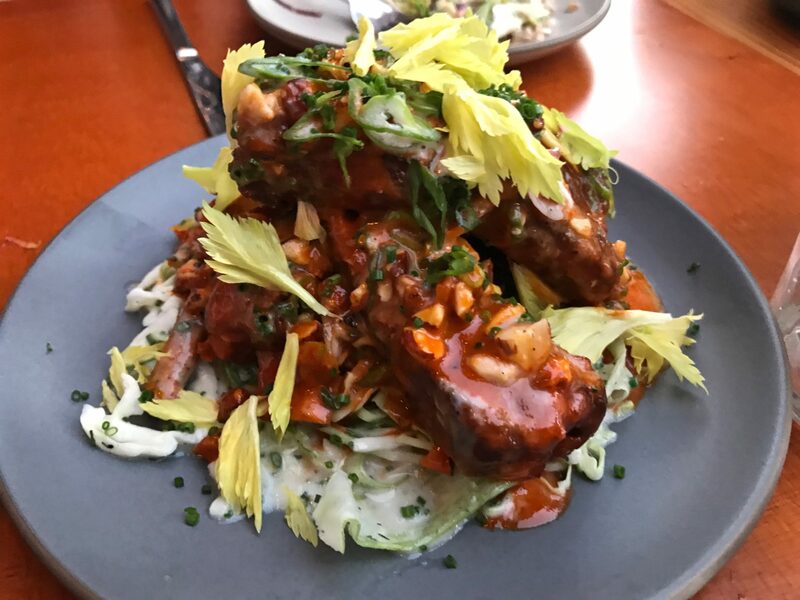 We also ordered the Calabrian Chili Pork Ribs; almonds, scallions, cabbage slaw ($17), which garnered another “Wow” for the restaurant. It was slightly spicy with the crunchy slaw. Good stuff. 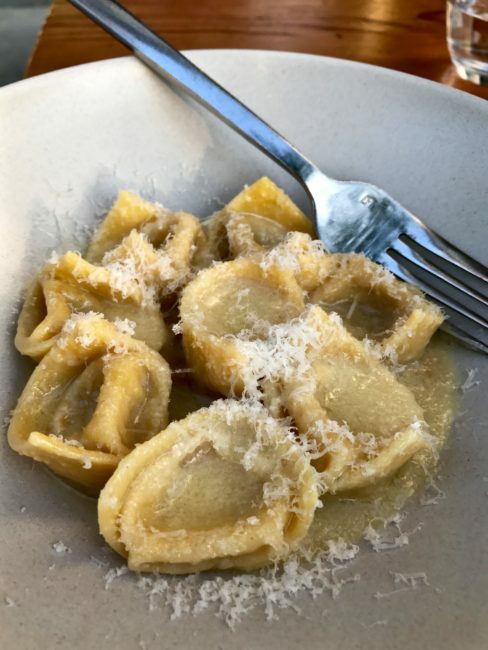 For dinner we ordered three servings of the Tortellini in Brodo and one order of the Saffron Torchietti to share. We also tried the Spelt Maccheroncini (yes, it’s spelt correctly), which is pasta made from spelt flour with wild mushrooms, cavolo nero and egg ($16). Just like all the other dinners, it was a winner. Alimento also offers platters for sharing. One of the platters on this evening was a 24 oz. Prime Ribeye Tagliata with potato fonduta and roasted mushrooms. Although we decided to pass on the Fred Flintstone sized slab of meat, it looked good when it passed by on its way to another table. I refrained from grabbing it. Other platters include a $33 Whole Grilled Orata (fish); calabrian chili, beans, pesto trapanese (I almost ordered it so I could sing that I was turning Traponese) and Bagna Caoda DOP; bread, vegetables and egg ($29). 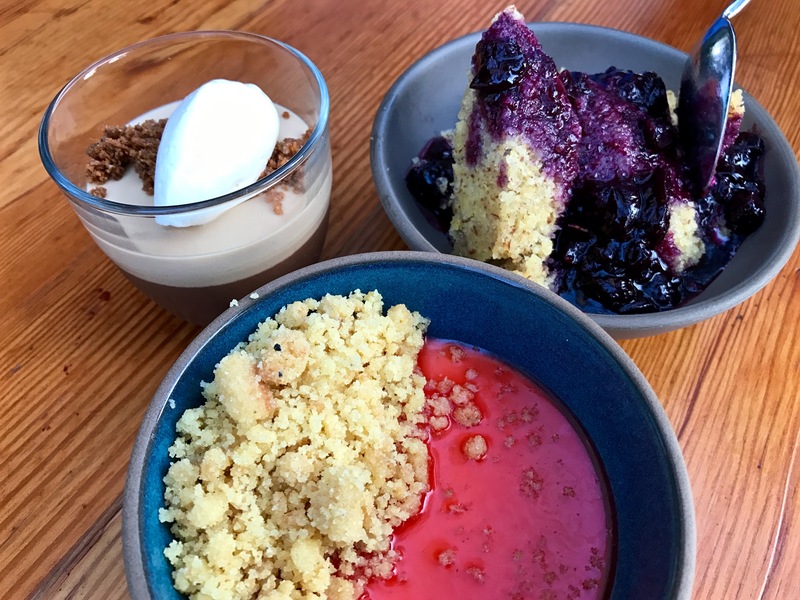 Although you would think we would have been quite full (wait, you know we never get full), once again on this evening we ordered the three desserts to share. I found out with seven people it’s a lot harder to sneak extra bites. 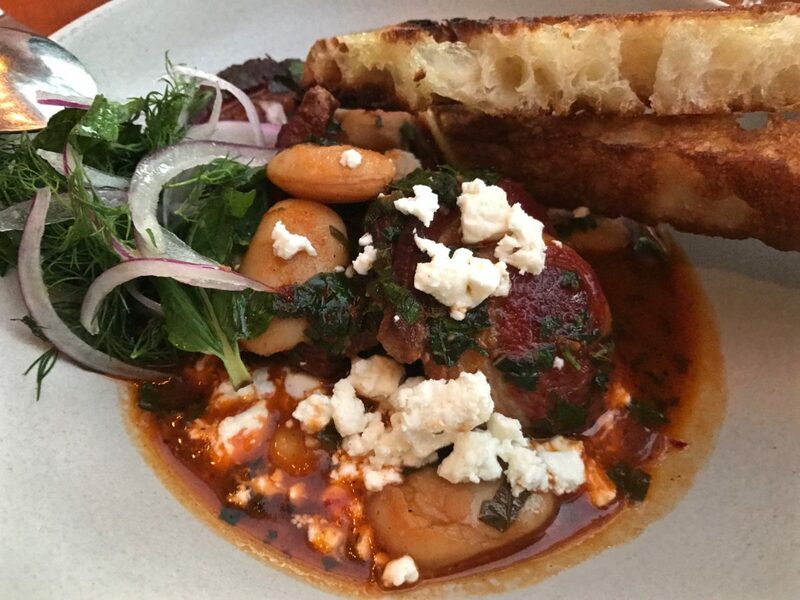 Despite two visits and 11 diners, we have only tried about half the menu and there are so many other dishes still calling our names, which will necessitate a return visit sometime in the near future. Yes, I know…a tough job. Corkage, I will say, is a tad steep. It’s $25 corkage for the first two bottles and then jumps to $50. There are a few bottles on the wine list in the 50 buck range, so it’s your choice. By the way, if you don’t drink, you can get out of here with a very reasonable bill. If street parking is unavailable (you have to get lucky), there is valet parking ($5) in front. Reservations are a must, as the restaurant is small and the line for walk-ups can get long. Alimento lived up to and exceeded the hype, so it gets my highest recommendation. It is now the leader in the clubhouse for MaiTaiTom’s Restaurant of the Year at the halfway point of the year, although we might give Manuela another shot, because it is running neck and neck with Alimento. 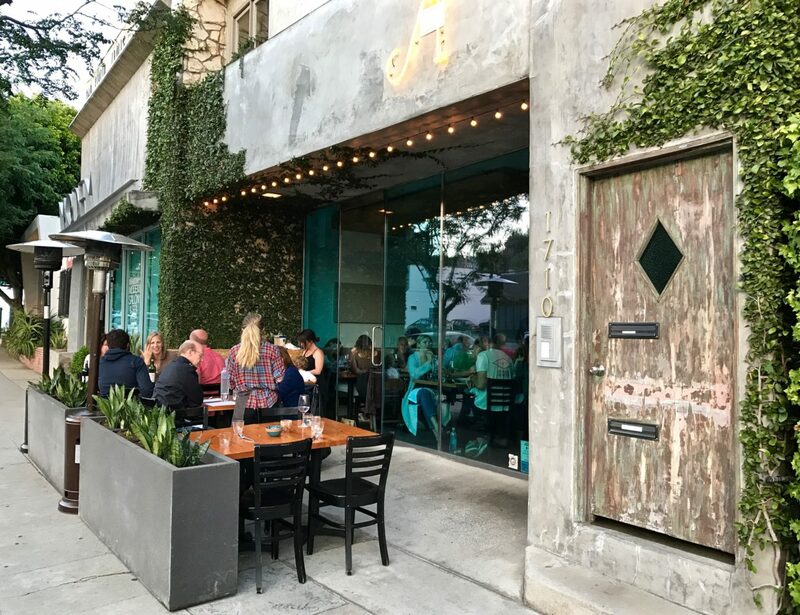 In addition, next week Tracy and I will be visiting perhaps L.A.’s most highly touted restaurant (and a place you need to book months in advance). Will Alimento remain in front? Stay tuned! Hours: Sunday & Tuesday – Friday 5:30 p.m. – 10 p.m. • Friday/Saturday 5:30 p.m. – 11 p.m.